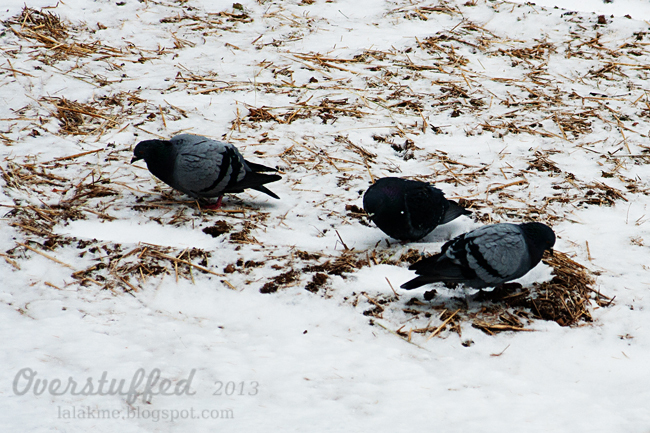 Some super fat pigeons eating all of our newly seeded grass. I guess they're getting ready for their winter flight south. It snowed this week. And it got really, really cold. I am okay with the snow. Mostly. It's beautiful, after all. It can get a little annoying once we have twenty feet of it on either side of our driveway with more coming, but I do think it's very pretty. Chloe came home from school on the day that it snowed and told me how happy she was that there was snow. "I love playing in the snow at recess, Mom! I forgot how wonderful it is to have the world be all white and muffled when you talk. It's my favorite thing." Yes, snow is pretty awesome. It's the cold I'm not okay with. I am always freezing anyway and I don't need the weather to help me freeze even more! In the winter, all I want to do is cozy up into my comforter with my heating pad and fuzzy socks and read a book. And drink hot cocoa or tea. And cuddle with my kids. I wish humans hibernated. It sounds so lovely, doesn't it? Flying south seems like a good option, too, but since I don't have wings or the money for a plane ticket and a place to stay in the Bahamas for six months, I'll have to stick with hibernation. Snow already?!?!?!? Man! You don't get much of an autumn, do you? I'd die - autumn is my favorite. I seriously could go to bed for the night everyday right after dinner once it gets cold and dark outside. Sorry for your quick-coming Winter. Hang in there. We got flurries on Tuesday, and you would have thought I'd won the lottery. I looove snow! You know, you only have to go as far south as Beaumont, Texas to get to a more hospitable climate this time of year. It's 61 degrees here...of course two days ago it was 31, but that's the weather in Beaumont...wait ten minutes and it will change. Enjoy the snow!